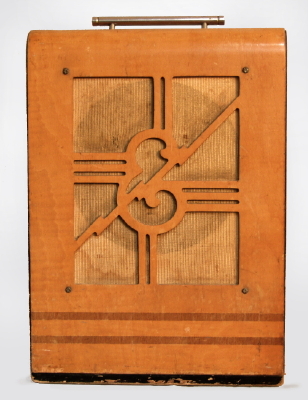 Epiphone Electar Zephyr Model Tube Amplifier, c. 1940, made in New York City, natural maple finish, laminated maple cabinet. Epiphone's big blonde baby from just before WWII, cased in sparkling maple with a cutout E logo grille. This was a powerful amp for its day, with a smooth, warm tone that turns to furious overdrive when cranked. One of the best and most professional quality amplifiers of the 1940's, and a great gigging amp in the 21st century. Height is 24 in. (61 cm. ), 16 in. (40.6 cm.) width, and 8 3/8 in. (21.3 cm.) deep. Recently restored with period N-O-S tubes and new power cord. Ready to gig. Overall Excellent Condition.